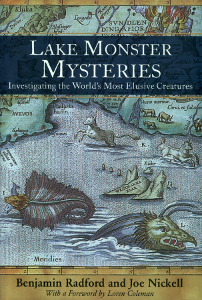 In my book on the subject (shown here), I describe some of the numerous lake leviathans I have stalked-primarily in the U.S. and Canada, as well as in England and Scotland-in my roles of skeptical Cryptozoologist and Monsterologist. 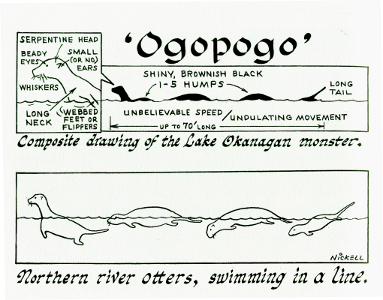 Often this was for a television documentary or series, involving such alleged monsters as "Ogopogo" at Lake Okanagan, B.C. (National Geographic Television), "Cressie" at Lake Crescent, Newfoundland (History Channel), and "Champ" at Lake Champlain (Discovery Channel). I have also searched England's Lake Windermere and Scotland's Loch Ness, as well as Lake George and Silver Lake, in New York, and Lake Memphremagog, in Vermont and Quebec, among others. At none of the lakes is there convincing evidence for a great unknown monster, whereas otters represent a common possibility. 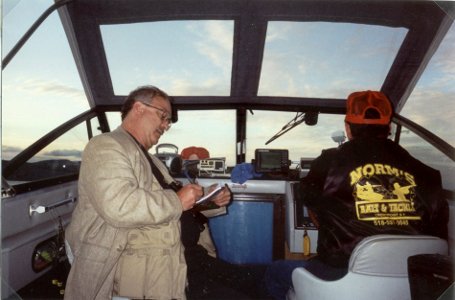 The photo here shows me on a sonar-equipped boat on Lake Champlain. See also "Nessie" Hunter.